As I write this, we are enjoying what will probably be one of the last “cool” evenings of the year. We have just passed the spring equinox, when the length of day and night are equal, and the official first day of spring. There’s a reason it’s called spring. Its name signifies the time when plants “spring up” from the ground. Here at the Redland Fruit & Spice Park we have a multitude of specimens who are putting on quite a show for us. Some of these are impossible to miss, while others take a bit of looking into, but are spectacular in their own way. 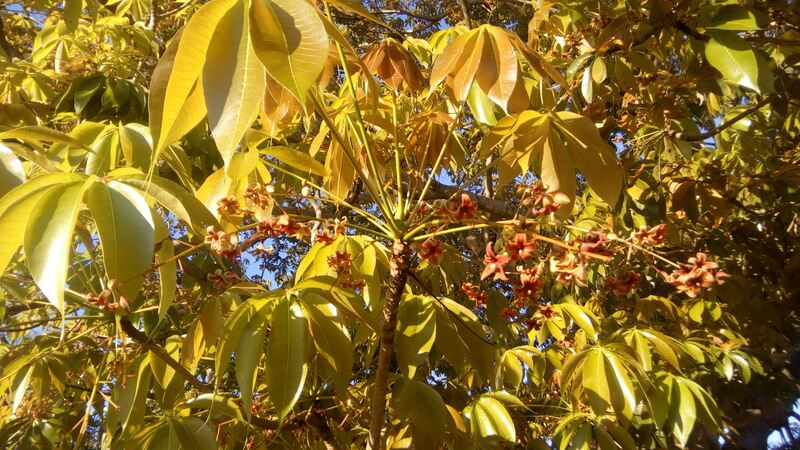 First, we have the absolutely, unmistakable Bangar Nut, Sterculia foetida. 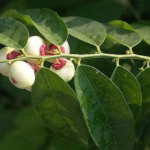 It produces an amazing bright red fruit that, when in full bloom, is noticeable throughout the park. But taking a deeper look at the meanings of its genus Sterculia and specific epithet foetida, which mean “smelly” the flowers emit an overwhelming smell of mothballs! It gets its name from Sterquilinus, the Roman god of manure, and the word fetid which describes something unpleasant. Our friend Linnaeus, who described this species in 1753, sure had a way with words! It is a large majestic tree, but don’t plant it outside your bedroom window if you don’t want to sniff this smell! The tree can be found at the start of African section next to the Akee. The next show-off is the Cut Nut, Barringtonia edulis. This otherwise modest tree explodes with huge creamy-colored flowers that resemble bottle brushes. This flower releases a pleasant scent, and the seed has been described as tasting like water chestnut when raw. It truly is exotic and striking when in bloom. This beauty is tucked safely in our Asian greenhouse, on the west side near the Bilimbi. Finally, I would like to draw your attention to an often overlooked specimen the Pacaya palm, Chamaedorea tepejilote. This pretty but unassuming palm is native to Guatemala and El Salvador. Resembling ears of corn, the immature male flowers, or inflorescences, are eaten, mainly raw in salads but also battered and fried. In fact, the name tepejilote means “mountain maize” in the ancient Nahuatl language of the Aztecs. While the flowers may be tasty if not showy, the fruit that results is beautiful. The Pacaya may be found in the Tropical Americas fruit forest near the greenhouse. We have managed once again to travel from Africa, through Asia, and back to the Tropical Americas. Be sure to put our upcoming events on your calendar—one of my favorites is the Redland Blues and BBQ Festival April 6 – 7 2019. We have added more music, more fun, and more BBQ this year! I hope you enjoy the riot of color and scent that the end of spring brings to the Park, but don’t forget to search out the less obvious treasures of our collection. Not a day goes by here without a surprise! The unique 37-acre public facility is owned and operated by the Miami-Dade County Park and Recreation Open Spaces. Located in South Florida. 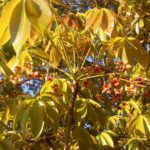 The Park’s tropical climate can be found nowhere else in the continental U.S. and hosts over 500 varieties of fruits, vegetables, spices, herbs, and nuts, and other commercially important plant specimens from around the world.